AMD has announced what it claims is the world's first 'supercomputing' graphics card, the FirePro S10000 12GB Edition - an upgrade to the 6GB model it announced back in November last year. 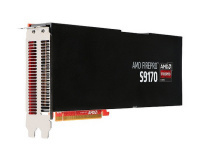 Designed for high-performance computing users, the FirePro S10000 sits very firmly at the top of AMD's GPU tree. Based on two 28nm Graphics Core Next GPUs, the original 6GB model boasts a 1.48 teraFLOP peak double precision compute rate and a 5.91 teraFLOP single-precision rate. Available in passive and actively cooled variants, the FirePro S10000 draws 375W of power per card and offers a 384-bit memory bus with 240GB/s of bandwidth per GPU for a total of 480GB/s. 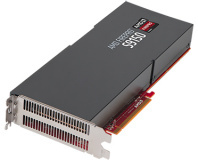 Unlike the Tesla cards rival Nvidia aims at the supercomputing market, AMD's FirePro S10000 is a fully-fledged graphics card as well as an accelerated co-processor. Each board includes at least one Mini DisplayPort and DVI output, with the actively-cooled version also offering an additional three Mini DisplayPort connections. As a result, the boards have already started to find a home in extreme high-end workstations as well as headless supercomputing and high-performance computing (HPC) clusters. As is usual for such an unveiling, AMD had plenty of industry support with figureheads from companies including Dassault Systèmes and CAPS extolling the benefit of the increased memory on the new model. Sadly, pricing was not announced. AMD's presence in the GPU-accelerated supercomputing market has been overshadowed by rival Nvidia. 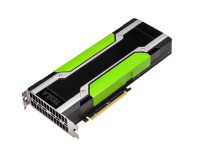 With a 12GB S10000 board, however, that could change: Nvidia's HPC-targeted equivalent, the Tesla K20X, has just 6GB of GDDR5 memory and lower peak performance of 1.31 teraFLOPS double-precision and 3.95 teraFLOPS single-precision. As a single-GPU board, however, the Tesla K20X enjoys a significantly lower TDP at 235W. While AMD may be positioning its 'supercomputing' S10000 as a Tesla K20X competitor, however, its admission that the video output enabled board may find a home in the high-end workstation market places it somewhat closer to Nvidia's Quadro K6000. Announced in July, the Quadro K6000 offers very similar specifications to the FirePro S1000: 12GB of GDDR5, a 384-bit memory bus, and claimed single-precision performance of 5.2 teraFLOPS. As with the Tesla K20X, however, it easily beats the S10000 in power draw with a TDP of 225W. AMD still has a way to go to catch its rival in market share: of the 54 systems in the latest TOP500 supercomputer list to use co-processor acceleration, 39 used Nvidia GPUs to just three with AMD GPUs - leaving the company outnumbered even by Intel, which scored 11 wins with its Pentium-based Xeon Phi Many Integrated Cores (MIC) x86 co-processor cards. The AMD FirePro S10000 12GB Edition is due to launch some time early in 2014.